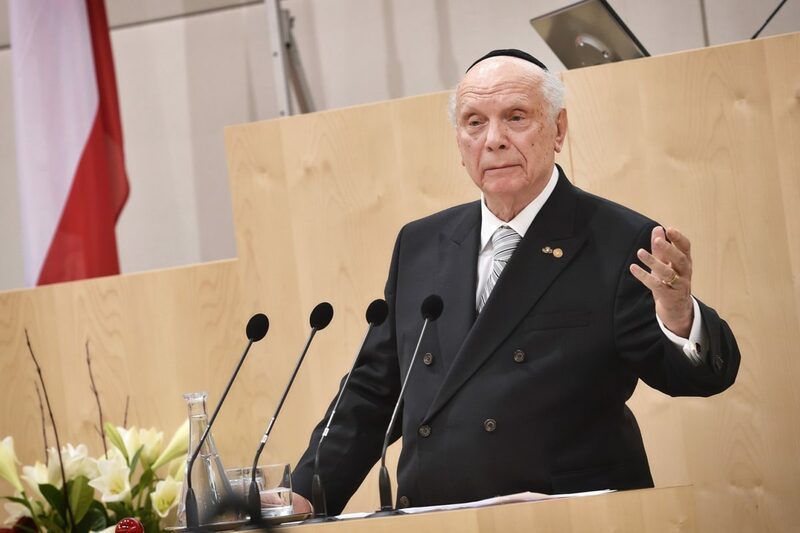 As a Vienna-born Holocaust survivor, I recently accepted the invitation of the Austrian Parliament President, Wolfgang Sobotka, to give the keynote address on the 80th Anniversary of Kristallnacht. It was an emotional return to my boyhood hometown, where I first experienced the horrors of anti-Semitism. But it was also painful, knowing that this cancer has reappeared and become widespread. It brought back memories of November 10, 1938, when I watched indifferent police and firefighters stand by as my synagogue, the Polnische Tempel in Vienna, burned to the ground. Heinrich Heine, the German-Jewish poet, spoke as a prophet when he said, “Where books are burned, in the end humans will be burned, too.” My experience taught me that those who burn books, dehumanize Jews, and burn synagogues would burn human beings in the crematoria of Auschwitz, my family’s graveyard. I witnessed SS and SA troops vandalize and plunder the apartments in our building. The next morning, on my way to school, I saw Jewish men lined up in front of the Ministry of Defense building, waiting for their deportation to the concentration camps at Dachau and Buchenwald. Some never returned. I learned, for the first time, that children are not born with hatred –they are taught to hate. After the Holocaust, I did not think that we would have to talk about anti-Semitism again. The cancer of anti-Semitism seemed to be in remission – it was no longer socially acceptable. But now the cancer is back, and it has metastasized in Europe and in the United States, the latest manifestation in Pittsburgh. The internet has turned into a borderless space for anti-Semites to find and encourage one another. Europe has had a tragic history for Jews: inquisition, persecution, ghettoization, pogroms, and the Holocaust. After emancipation, wherever Jews were welcome, they made a contribution to culture, science, music, medicine, and the arts, as well as to the welfare of their host country. Jews always fared better in times of stability and suffered during periods of turbulence and instability. The current upheaval in the European Union, including the integration of immigrants, some of whom have been indoctrinated with hatred for Jews, threatens the safety and security of Jews in many European countries and has stimulated the rise of anti-Semitism. Europe’s peaceful and prosperous future is linked to a Europe free of anti-Semitism and camouflaged anti-Zionism. In an encouraging sign, some world leaders recognize that and are no longer silent. German Chancellor Angela Merkel recently stood in a Berlin synagogue and condemned a troubling resurgence of anti-Semitism in her country. She warned that even a subtle erosion of vigilance against hatred can allow it to take root anew. The same day, French Prime Minister Edouard Phillippe cautioned that anti-Semitic incidents had increased nearly 70 percent this year. It is also encouraging to see the youngest European Head of State making it a priority to combat this plague. Austrian Chancellor Sebastian Kurz, currently serving as the President of the Council of the European Union, convened a high-level conference this month to explore how to combat an alarming rise in anti-Semitism and anti-Zionism across Europe. The conference is a clarion call to action. The scourge of anti-Semitism is like a genie out of the bottle: we can’t undo it, but we can hope to contain it while we try to prevent the poisoning of the current generation. Let’s be clear: anti-Semitism not only victimizes Jews, it’s an indicator of how a society treats other religious, ethnic and racial minorities. Anti-Semitism is a hate crime perpetrated by those who want to erase the dignity and values of each and every human being. It is the fodder for violence against humanity, culminating in crimes of racism and xenophobia, its natural mutations. In the Book of Leviticus it is said: “neither shalt thou stand idly by the blood of thy neighbor.” Silence is not the answer. It only encourages the perpetrators and demands a high toll in the end. We must isolate the perpetrators who incite hatred and conflict and reject peaceful co-existence. We can learn from this that disunity and division, hatred and discord are the false answers to the many questions that living together in a society ask from us. We have to win over the silent majority – and shake them awake. I am convinced that the silent majority wants peaceful coexistence in mutual respect. In Europe, government alone cannot stem the scourge of anti-Semitism; this work requires coalitions of business and religious leaders, intellectuals and educators. Every nation should be encouraged to designate an official whose sole task is to coordinate efforts to stem hatred and encourage a sense of common humanity. “And you shall teach them to your children and speak of them,” says Deuteronomy 6:7. Teaching “love your neighbor as yourself,” and a transmission of the democratic values are the cornerstone of the civilized world. Maybe, in classrooms of diverse peers, the children and grandchildren of those subsumed by hate will learn why hate leads nowhere. Hate has never built anything. Let us work together with clear commitment: Never again. Let us resist man’s inhumanity to man. Our common destiny requires us to develop bonds of common humanity. United we prevail, divided we fail. We cannot change the past, we must remember and learn from it; today, we can shape the future for our children and grandchildren, a future of peace, freedom and democracy. Rabbi Arthur Schneier is president and founder of the Appeal of Conscience Foundation and senior rabbi of Park East Synagogue in New York.